A thread this long with so many pictures to download would make a very poor sticky. I think a photo album would be the way to go. If the text would be lost in a photo album, would an alternative be, to start a new thread labelled "Roaring 20's Superhets - Part 2" and so on (Part 3, Part 4.......Part x) - with a maximum of 3-4 pages in each thread? You would only need to load a few pages at a time. Moderators could lock the old threads at pre-determined no. of pages? Are we done talking about 20a Super-Hets? Of all the supers I have, this is my fav. was the first super-het avaliable to the public. were built in the E.I.S. shop to test the kit. the radio had only one stage of audio. you get it all set up. We ran out of those 20's Super-hets! Duane, Dale, and you, Ron, got'em ALL!!! Last edited by Rick A on Jun Fri 26, 2009 2:42 am, edited 1 time in total. Duuhhhh, Ya think??? I Wonder, who da ya spose might have one? Duuhhhh, Ya think??? [/b] I Wonder, who da ya spose might have one? I will contribute my RCA Radiola 82 radio. I have the tuner and amp chassis working properly with a good speaker provided by a fellow forum member. I am waiting on my uncle to get over some health issues so I can go pick up the cabinet which according to my uncle is in excellent condition. He originally got the two chassis for free from someone who was going to throw them away. I asked my uncle if the guy had the cabinet and much to my surprise he had it in excellent condition and guess what it was free as well . I have no pictures yet. I will contribute my RCA Radiola 82 radio. I think the Radiola 82 was made in 1930 and is an AC set. work pretty much as well as copper wires. Nice straight forward chassis. 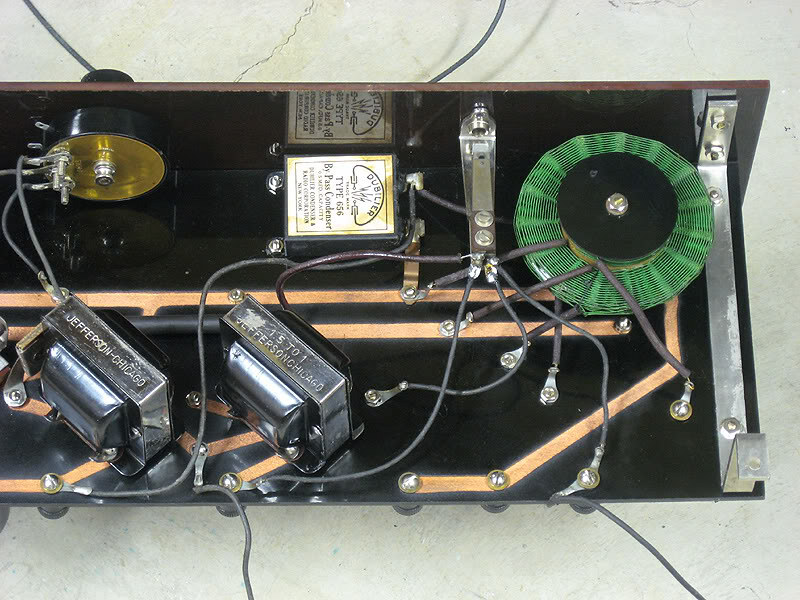 Note the "Supertone" IF transformers and the connector posts for the loop antenna are the stand alone posts situated on the far opposite ends of the chassis. When the set is running, all of the tubes filaments are set at the full 5 volts. There are no filament voltage dropping resistors or filament controls on this set. To run the set on 6 volts for the filament supply would require an external ballast resistor. The two controls on the front panel work the bias voltages to the IF transformers. Because the ground line is positive, the 01A and 12A audio tubes derive -5 volts bias to the grids straight from the the - side of the filament line so no C battery connections are required. The phone jack also acts as the power On/Off switch. To turn on the radio requires a speaker to be plugged in and to turn off the radio requires to unplug the speaker. 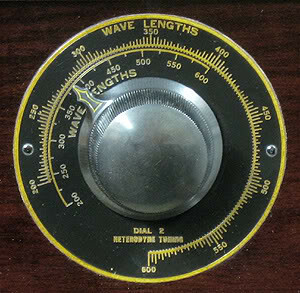 Notice how the antenna dial and osc. dial are very different in their scales. Last edited by Indiana Radios on Jul Tue 18, 2017 2:31 am, edited 3 times in total. I dunno, it kinda makes sense to me since you can only view 1 page at a time. Problem with photo albums is they lack the informative posts that talk about the sets being pictured. Its nice to have all that in one spot. nightmare to keep all the connections tight. Oh ok. I didn't know when exactly it was made. Ron, your Leutz Model L would probably be the centerpiece of any collection. Any chance we could see an interior view? I have a poor mans Model L, which I may post photos of. Michael, the Supertone is awesome (as are all the other radios on your website)! "Essentially the same chassis as the Radiola 60, but more expensive burled-Walnut highboy cabinet and a dynamic speaker. Used 8-UY227, 1-UX280 (power amp), 2-UX281 (power supply), and 1-UX250 (as part of the dynamic speaker circuit). Third series of Super. No untuned, 2 tuned, 2 IFs, 1 Audio. $375.00. IFs peak at 180 KC." 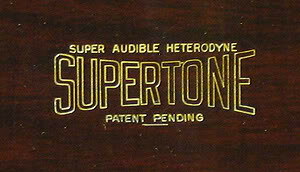 The Clarence Buckwalter Supertone, introduced in August 1925, could be built in two versions that I've seen. Indiana Radios has the version where the IFs are on the top of the baseboard. With the other, it was recommended they be placed under the baseboard for a cleaner look. There was a reference to the Buckwalter "Burad Supertone" that had only six tubes, but more info eludes me. The company was headquartered in Chicago. A reference I have says iron IFs peaked at 40 KC. Once they addd AC power they got BORING ! ! ! I guess I was talking crap. You only load the thread "one page at a time" as it is. Please disregard. 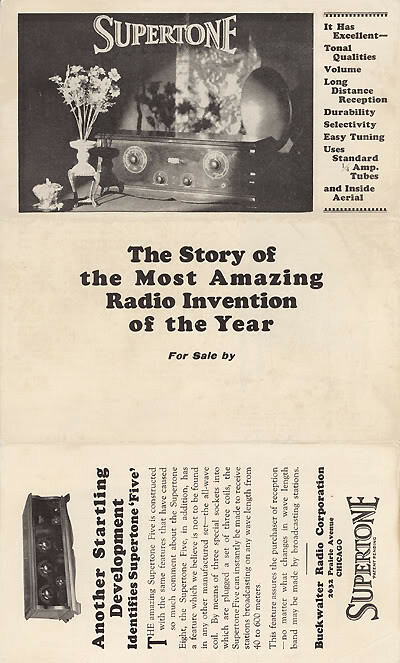 The radios being added to this thread continue to be amazing, and the advertising copy and so forth is an important and very interesting part of the history. I would certainly include AC superheterodyne sets from the 1920's, as they show even further achievements by saving owners the cost and nuisance of dealing with batteries. My radiola 80 uses two 545 tubes in the audio power amp. Last edited by John Kusching on Nov Tue 18, 2014 2:38 pm, edited 1 time in total. You don't have a Lacault Phenix L-2, you have a much rarer model L-1. 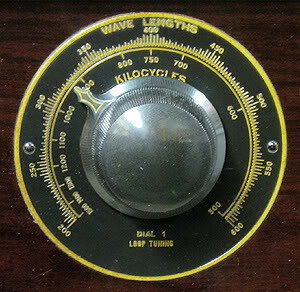 The oscillator & antenna coils in that style make it a "1", introduced early in the Superhet world, March 1924. The air core IFs and filter run at 115 KC which was very high for those early days. The L-2 was introduced in May of '24 and the last ad I found for the L-1 was in October of that year. Love seeing that L-1 as you don't see many of them. Lacault started a long dynasty of good radios with that set. 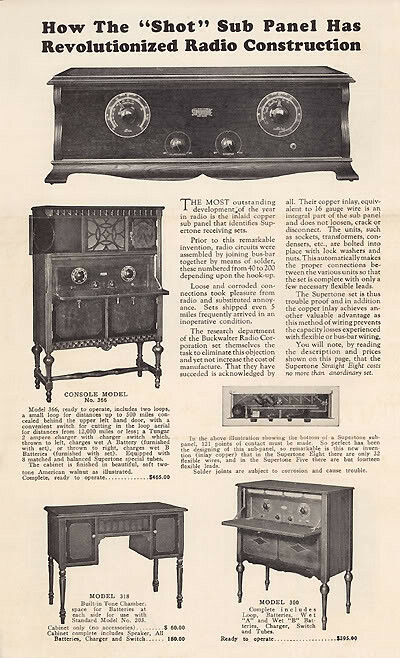 By the way, your radio is one of the earliest as shown in ths ad from Radio Broadcast, July 1924. They're exactly the same! Last edited by Rick A on Jun Thu 25, 2009 4:12 am, edited 2 times in total.